Fresh Basil Gelato and how we end up deciding on new flavors! We love what we do. To say we have a passion for gelato and chocolate really does not describe how much we love what we do. For the past 10 years gelato and chocolates has been at the center of our lives in many ways. One of the ways we think we are different than other places on Kauai is our emphasis on local flavors. Not just adding some coffee and macadamia nuts to a flavor, but finding ways to showcase many different ingredients found on Kauai. Sometimes the inspiration comes when we are shopping at one of the Sunshine Markets on Kauai. We have over 300 flavors in our recipe book right now and it constantly is being added to. Many times customers will ask us what inspired us to make a specific flavor. The truth is we have many sources of inspiration. Sometimes, like with our newest flavor, the inspiration comes from a local grower who brings to us something from their garden or farm. They just come in and say, hey, have you ever made anything with Jackfruit or Starfruit, or whatever they may have growing at that moment. Last week, a local grower, Beck’s Basil, came in with a bag of fresh basil. Lovely big leafs with tons of flavor. She asked us if we had made Basil Gelato before. We told her we had not, but after seeing the basil she had with her, we were pretty excited to try to see what we could create. So we quickly came up with a recipe that would take us 2 days to make. We wanted to infuse our base with the basil and know that the longer you can do that, the more intense the flavor. We chopped up some of the amazing fragrant and flavorful basil and heated it with some of our base. We then let to infuse for 24 hours before making into a pan of gelato. The final product we love. 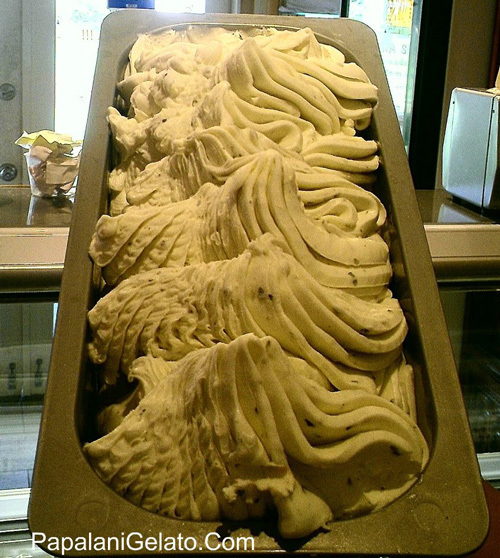 The creaminess of the gelato base goes perfectly with the basil flavor. Apparently the flavor profile of basil is different depending on the species and how it is cultivated. To us, this particular basil has a flavor profile reminiscent of anise. We think it came out very well.